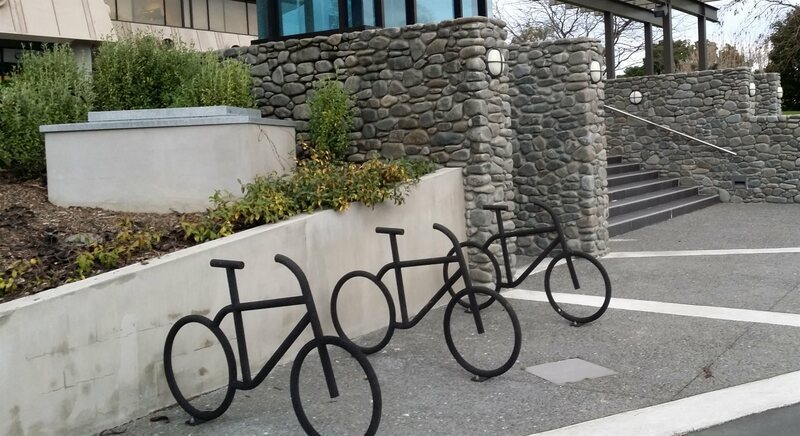 Building wonderful new cycleways is all very well, but the effect is somewhat muted if you have nowhere to park your trusty steed when you get to the other end. 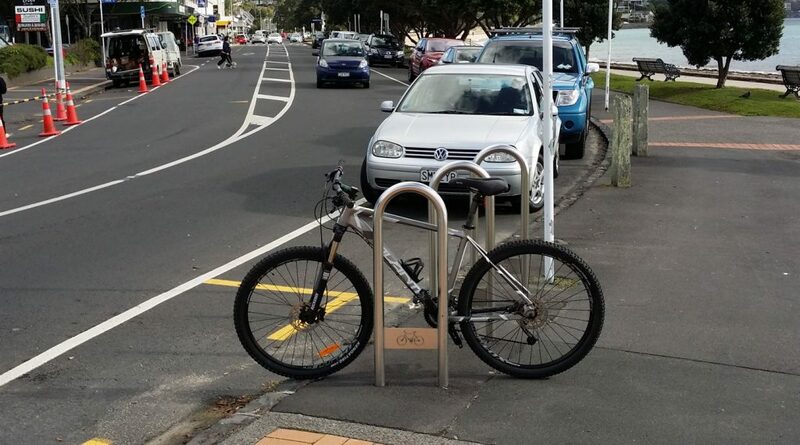 Granted, there is often a pole or fence handy (and a kickstand on a bike is worth its weight in gold when you can just park up anywhere unsupported), but it doesn’t quite send the same message as having some welcoming bike parking waiting for you. While I saw plenty of wonderful examples of bike parking facilities overseas, strangely there never seemed to be enough bike parking anywhere I’ve been, even when there’s thousands of them available. That trend is the same here in Christchurch, with supply invariably trying to keep up with demand. Here in Christchurch, many people seem to obsess over how much car parking will be in the central city rebuild (even though there was always more than enough pre-quake). 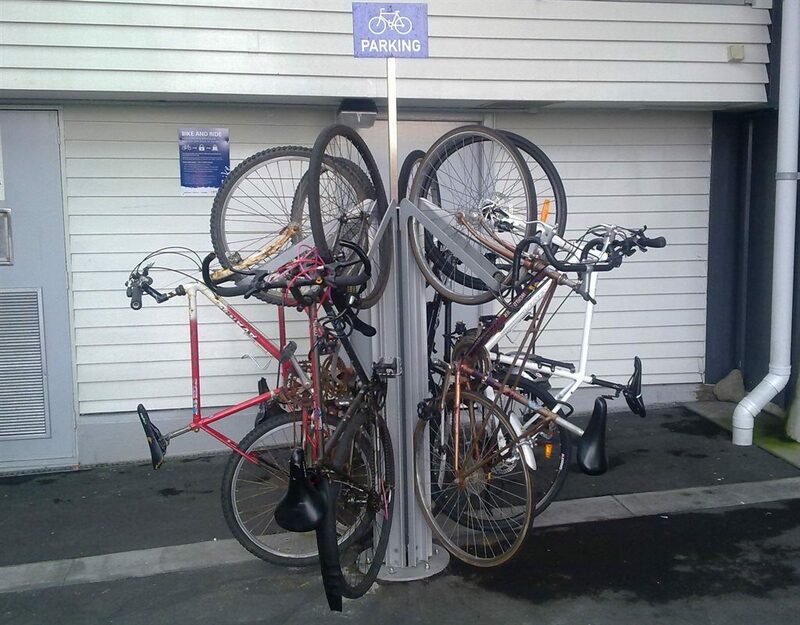 The Council has been pondering this and developed a new Chch Central Parking Plan this year to provide a framework for their future planning. While it is not surprisingly focused on car parking, it also does a reasonable job of identifying cycle parking demand in the central city (expected to be ~4000 spaces by 2041) and considering where that might be located. This includes a mixture of short-stay parking (where a simple hoop might suffice for popping in to a shop) and long-stay parking (where a covered, secure facility might be desired by someone working all day, perhaps with lockers and changing facilities). 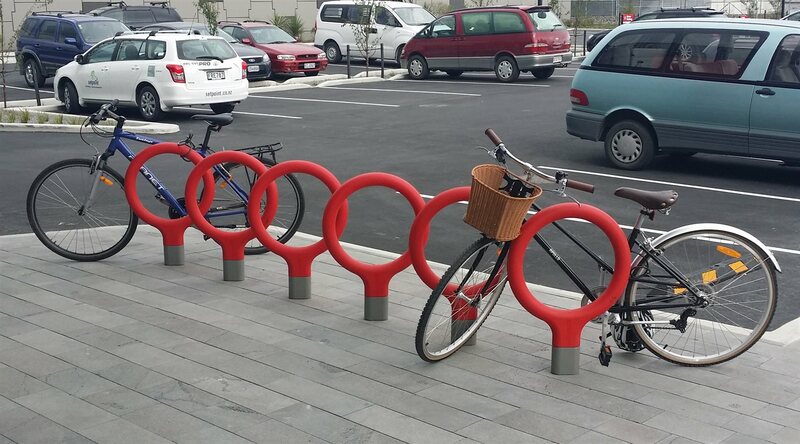 Already we’ve seen an example of the latter with the new cycle parking facilities at the Bus Interchange. 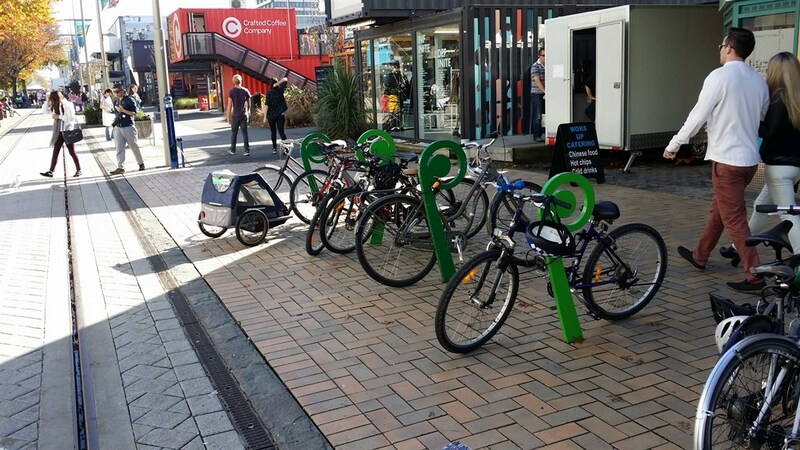 Outside of the central city, it can again be a bit of lottery as to whether you will find adequate bike parking provision. For example, our regular correspondent Robert found a mixture of options when surveying his usual local haunts. 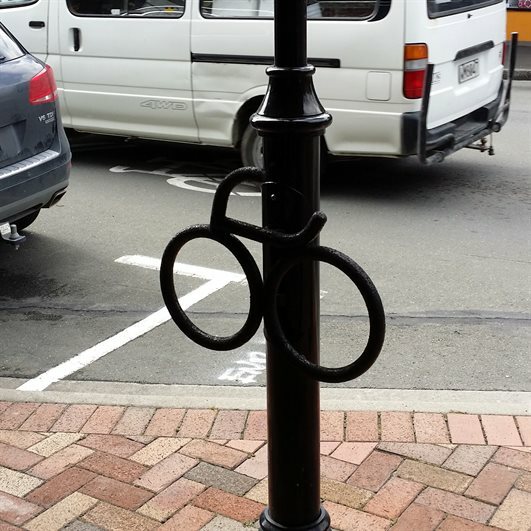 So where should we provide more bike parking? The obvious starting points would seem to be the major destinations; these might include shopping centres, supermarkets, libraries, and swimming pools. Popular attractions like Sumner and New Brighton beaches would also be handy as summer kicks in. The University of Canterbury has been busy adding a lot more bike stands around campus over the past year, although it’s a challenge to fit them around all the construction activity going on there. And for those who like to get out for a recreational or training ride, it’s always great when your favourite café has a few bike spaces while you revitalise yourself with a nice cuppa. 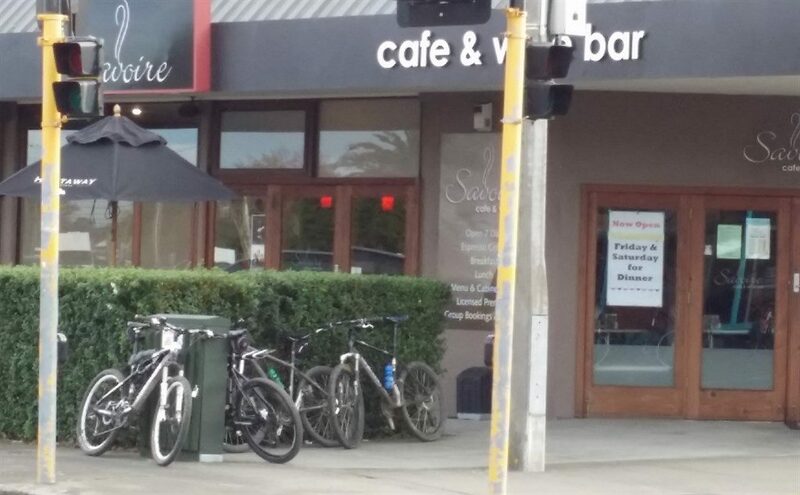 Beckenham café: do you prefer skinny bike racks or wide ones? 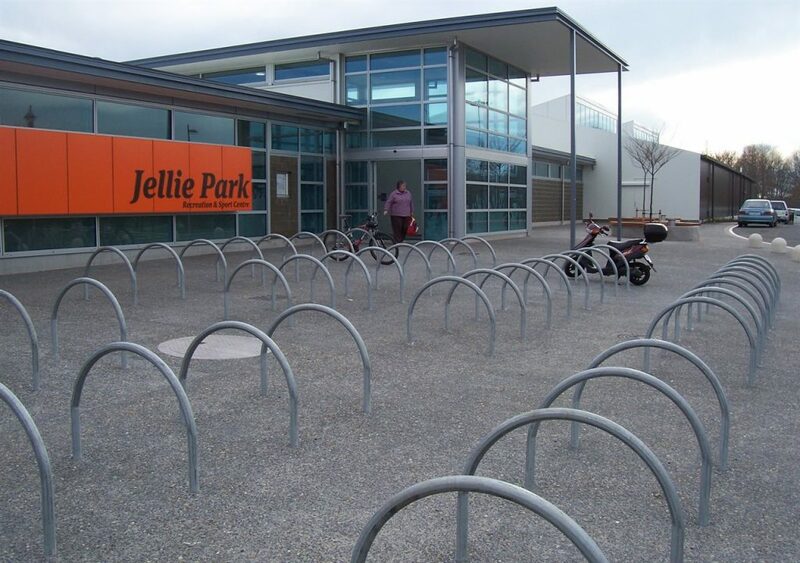 Heaps of parking at Jellie Park Pool – but couldn’t some of it have ended up under that overhang? It’s a healthy sign seeing so many bikes parked wherever they can all around the city these days. 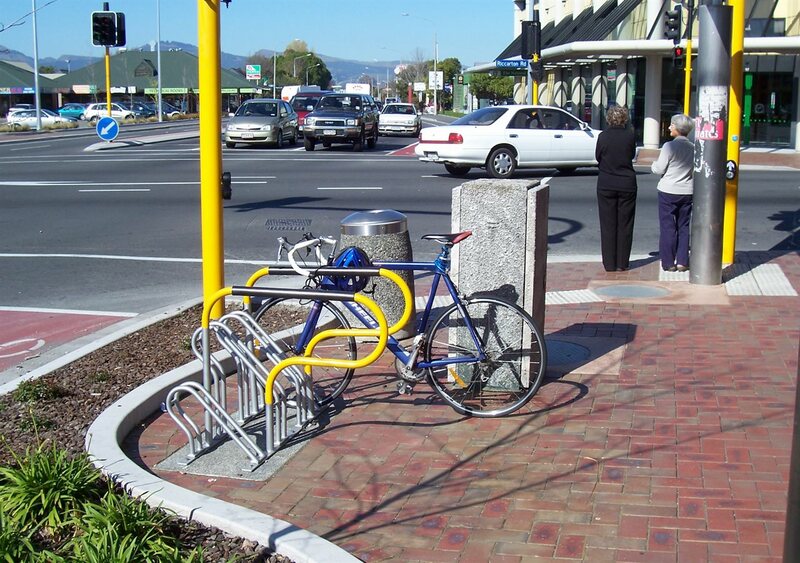 But it would be nice to a few more purpose-built racks popping up before the demand is overwhelming. 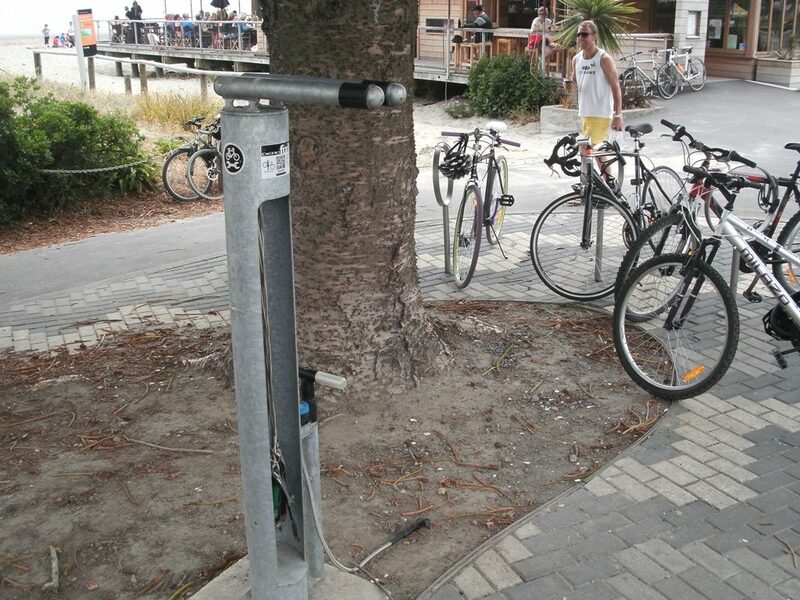 Where would you like to see some new (or better) bike parking around the city? Do you know what is driving the trend for circular Sheffield style racks though – they make it hard to stop your bike rolling compared to the original design with a flat top. I’ve noticed they’re popping up wherever the council is installing new infrastructure. I like parking right at the door where carparking is difficult. The Hospital perhaps? Great article, its really important being up these discussions about visible bike parking. I often don’t know where the parking will be before heading out and end up locking to a pole/lampost . We’ve been thinking about a site/app where the community can catalogue cycle locations around the city. It’d be as easy as taking a picture if it with your phone. 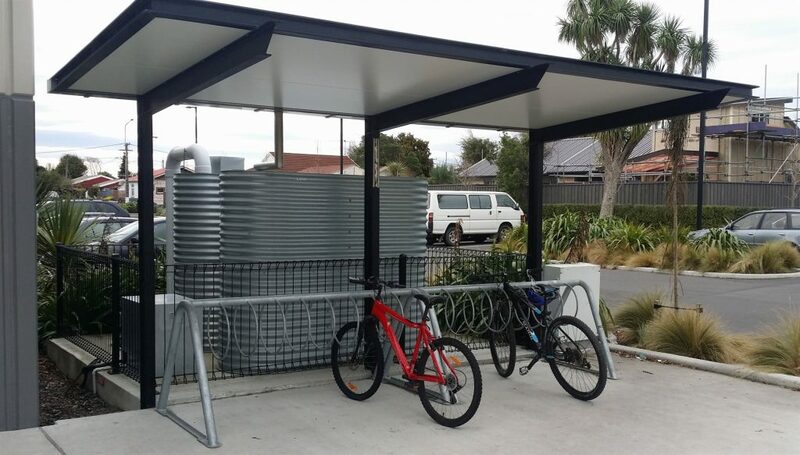 As more and more racks are put up it would be great to have an up to date database of where to find quality cycle parking. 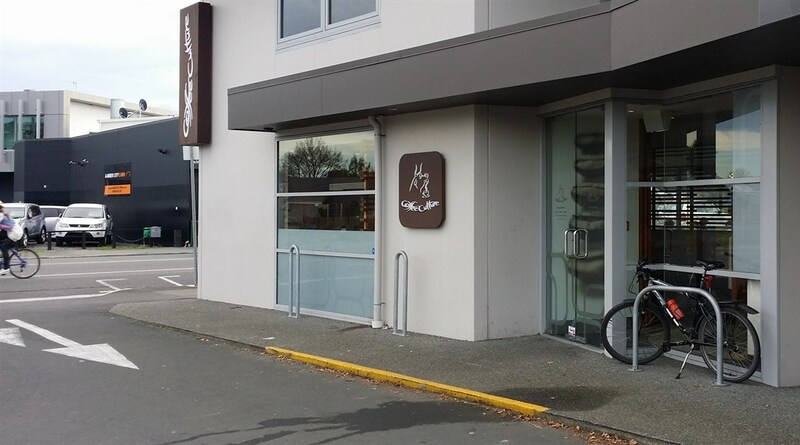 Luciano’s cafe (and the other shops in that complex) on Moorhouse Ave could do with bike parking. I’d also second the hospital for more (although it is a couple of years since I was last there). 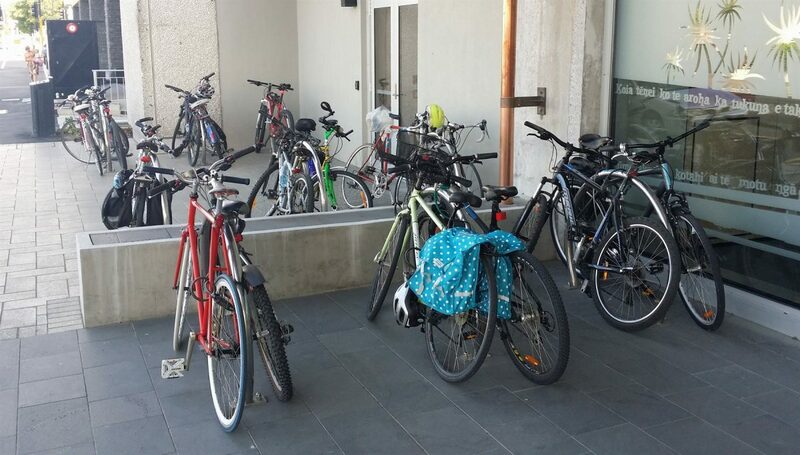 The way to get bike parking is for so many people to bike as to make the need apparent. 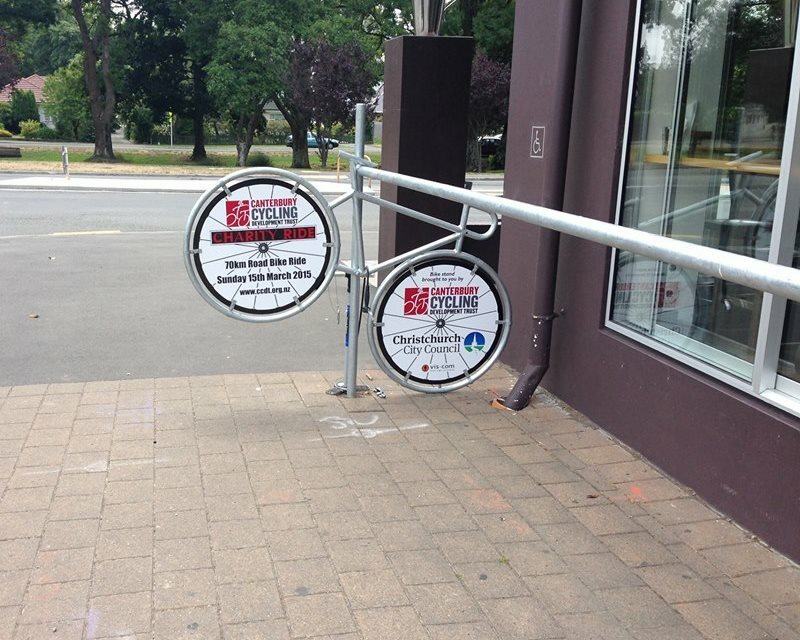 We also need to discourage bad bike rack designs that just take the front wheel and expose it to being bent and make it difficult to lock to the frame. Perhaps good practice in design could be promoted at the same time. There is space for at least a couple of stands beside the litter bins. 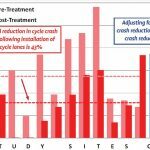 Previous Previous post: Cycling and the Law: What is a “Cycle”?